Enjoy live music and special events at the Athens Saturday Market this season. Wearing your red, white, and blue just might win you a prize at the Market. Wagon decorating contest and fun family activities to celebration the independence of our nation. Come out and enjoy a free tomato sandwich. 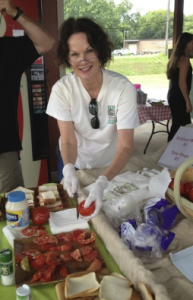 We use our growers’ fresh tomatoes on soft, white bread, slathered with mayo, and sprinkled with salt and pepper. Yum! If you are interested in showcasing your talent at the Market, send us an email.